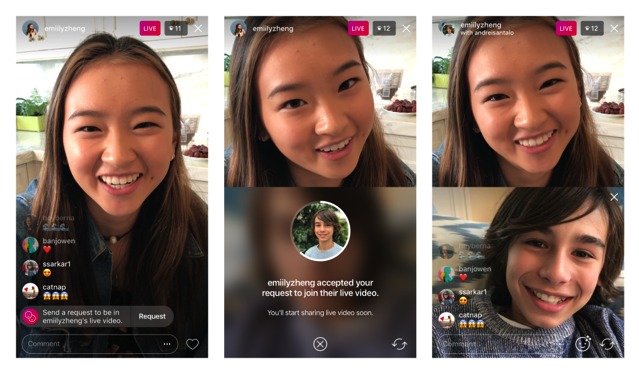 Starting today, you can request to join a friend’s live video on Instagram by simply tapping the new “Request” button. You will be able to see the button in the comments section when watching a friend’s live video. Once your friend accepts the request, you will see a confirmation, that will give you a moment to prepare before going live. When you host your own live video, you will be able to view requests from friends who want to join. You will see a notification for each request in the comments section. All you need to do is tap the “View” button and then choose to add your friend or cancel the request. There’s also a new icon with two smiley faces, that will have a red number showing how many requests you have. Tap the icon, and you’ll see both requests and current viewers. You can either accept a request or invite any viewer to join you. You can also remove a guest and add someone else at any time. As always, you can share your live video to stories once done, or simply select “Discard” and your live video will disappear from the app. To learn more, visit the Instagram Help Center.